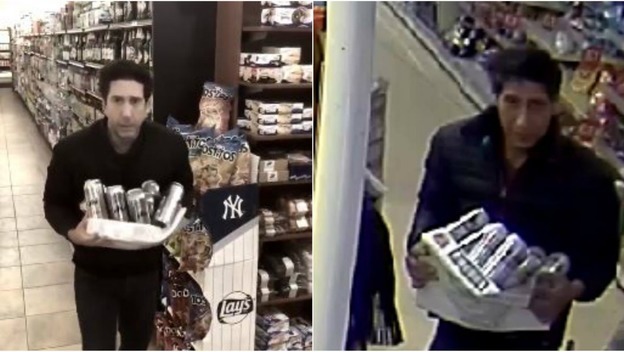 Actor David Schwimmer has responded to hilarious claims that a police issued appeal for an alleged thief bore an uncanny resemblance to his character in US sitcom Friends. Police in Blackpool posted on Facebook asking for witnesses to identify a suspect pictured leaving a restaurant in the town carrying what appeared to be a crate of cans. Joining in with the discussion on social media, Schwimmer posted a video of him recreating the police's image. "Officers, I swear it wasn't me. As you can see, I was in New York. To the hardworking Blackpool Police, good luck with the investigation. #itwasntme," he wrote. Lancashire Police responded to Schwimmer via its Twitter account, saying "Thanks for being there for us", before adding the hashtag #appreciatethesupport. The alleged theft happened on September 20, the police's original post said. Facebook users had quickly piled into the comments section, pointing out the suspect’s likeness to Schwimmer’s character Ross Geller in well-loved US sitcom Friends.